Its the season to be jolly! especially when you check out these lovely season varients from Kimparks Lab. From the fine folks who brought you “45Cube Cubings 큐빙즈”. Making waves at last years ART TOY CULTURE 2017 and remember seeing the prototypes. Our dear friend Limor Zamir reminded us that Cubings 큐빙즈 exists and the world needs them, HA. Ok, maybe a little overexaggerated but these Cubings are so cute in their minimalistic ways. 45Cube Cubings 큐빙즈 come in 2 variants to choose from and NOW with Xmas editions featuring Santa and Rudolf. Hold up, that is more than meets the eye. THEY LIGHT UP too, ADORABLE. Sold sepretly or you can go for the full package which features the impressive sledge. 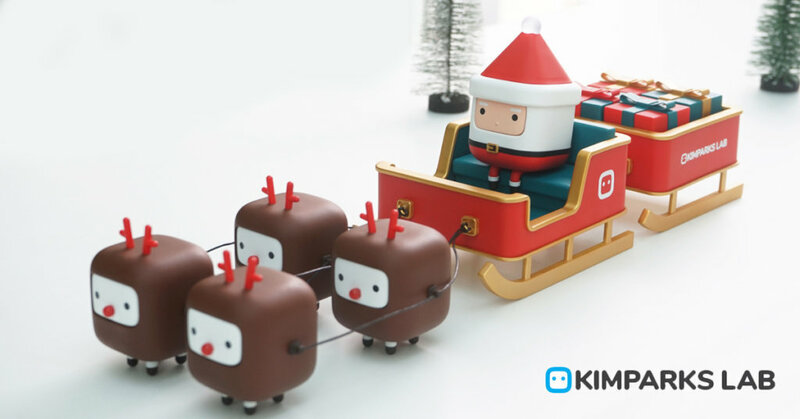 We are not much of a season toy collector but these Xmas version might have to go into our TTC stocking. Kimparks Lab is a design studio that creates various contents based on the cube form. We simplify the complex world of various forms into one concept called ‘Cube’. We will create the world of kimparks Lab by combining various fields such as product, graphic, character, animation and infinite spreading ability of cube form. The character ‘Cubing’ of kimparks Lab who makes everything into a cube like his own. Cubing is a cube-like character whose simplicity is maximized. It combines various design elements and presents various images. The new and exciting cubing friends and the witty stories that are added here will give you new fun and pleasant messages. A specially designed sleigh version will be produced in only three limited quantities. There will be 15% discount for pre-order period. Price will be changed to standard price after the event ends. Artists: 109 kim / Instagram Park / Instagram Park2 / Instagram and Limor Zamir on Instagram.